Ok, the champions had to get one player in. Still eligible for Bayern’s U19s, Früchtl is used to playing ahead of the curve, featuring 10 times for the Bavarians’ second string this term – keeping three clean sheets – and making the bench on three occasions for the first team. An athletic 6’4”, Früchtl also boasts the finesse befitting of a young man who plays the saxophone and clarinet with aplomb. Current Bayern and Germany No.1 Manuel Neuer is a fan, saying “his coordination is great despite his size, and his foot size!” Früchtl will need to keep every inch of his 14.5s grounded if he’s to fulfil his potential, with FIFA ‘18 giving the youngster a future rating of 86 – one point more than current two-time defending European champion Keylor Navas of Real Madrid has. Henrichs has already bolted down his spot as one of Leverkusen’s first-choice full-backs, featuring in 17 of their 23 games in the Bundesliga this season, and even laid on what proved to be the winner for Kai Havertz in the 2-1 win at Hamburg last time out; from left wing-back, despite being nominally right-footed. Speed, technique and versatility make Henrichs stand out from the crowd, and Germany coach Joachim Löw has taken notice, capping him three times to quell any ideas from Ghana, for whom he qualifies internationally through his mother. With a potential FUT rating of 84, Henrichs becomes as good as Bayern’s Joshua Kimmich in the game, and goes on to outstrip Manchester United right-back Antonio Valencia by a point. Watch: Meet Dayot Upamecano and learn about his roots! Rangnick’s surprise was understandable. Upmecano’s form is such that Marvin Compper, last season’s defensive fulcrum, has been sold to Celtic. One of the fastest players in the league despite his hulking frame, Upamecano’s distribution and calmness on the ball make him the trademark modern day centre-back, while his opener last Friday’s 2-0 win over Augsburg hint at a developing nose for goal. In FIFA, he overtakes Chelsea and Brazil star David Luiz, one of the most sought after defenders in the game due to his speed in defence. One of the alleged better centre-backs than Upamecano in the France U21 squad, Diallo in fact captains Les Espoirs. A dash slighter in stature, that hasn’t hindered Diallo’s reading of the game nor timing in the tackle, which both grow enormously in FIFA 18. A left-footer, he brings balance to Mainz’s defence and has flourished in a back three and a back four, completing 77 per cent of his passes so far this season. “In Germany, when I get the ball I’m always under pressure, meaning I need to know in advance where I’m going to pass it,” he told bundesliga.com recently. “You have to be on top of your game every second here.” New Arsenal scout Sven Mislintat’s alleged admiration is little surprise: Diallo ends up a better player than Brazil and Paris Saint-Germain stalwart Marquinhos in FIFA 18.
Who? Fans may not know much about the young Wolfsburg left-back yet, but that looks set to change soon. Capped at every level for Germany between U15 and U19 and a Fritz Walter Gold Medal winner in 2016, Itter was recently promoted to the Wolves’ first-team squad and now has five senior starts to his name. The first of those was September’s 2-2 draw with Bayern, and he was put in again against the champions on Saturday, playing 90 minutes in the 2-1 loss, in which Wolfsburg arguably gave the champions their toughest test in the fourth Jupp Heynckes era. Twin brother Davide-Jerome, a mirror image and right-back, was also given a pro contract by the club last year, but it’s Gian-Luca who’s scaling the heights quicker. If FIFA 18 is correct and he continues his trajectory, Wolfsburg could have one of the world's best left-backs in their squad, with his potential rating matching Barcelona's Jordi Alba and his 85 mark. Havertz may only be 18, but he has already developed into one of the most important players at an eminently impressive Leverkusen, contributing a team-high six assists for a side currently third in the table and looking like favourites to return to the UEFA Champions League after a two-year absence. Havertz became the club’s youngest top-flight player and scorer before passing his final high-school exams, prompting club captain Lars Bender to remark that he had “never seen such a complete player at the [then] age of 17." Two-footed, intelligent, and selfless, it is Havertz’s opponents who should now study him hard. A self-confessed admirer of Arsenal’s Mesut Özil, Havertz draws level to the Germany star’s cross-London counterpart Christian Eriksen on 88 points in FIFA 18. Denis Xhaka-ria was the Switzerland international’s affectionate nickname after replacing the Arsenal-bound Granit Xhaka at Borussia Mönchengladbach this summer. The youngster has a similar grit to his compatriot, but it’s his distribution that has really captured Foals fans’ imaginations. Zakaria had played four Bundesliga games before he misplaced a pass. Equally comfortable in the No.6 and No.8 positions – German footballing parlance for defensive and box-to-box midfield roles – Zakaria is well regarded by EA Sports, too. In Career Mode, he goes a level above Real Madrid’s engine room operator Casemiro’s starting rating. High praise indeed: the Brazilian, like Navas, is a two-time defending European champion. With over 100 top-flight games under his belt for Leverkusen, as well as 21 games in the Champions League, it’s easy to forget that Brandt is still only 21. A burly attacking midfielder who might not look like a natural footballer at first glance, Brandt has the fleet of foot and speed of thought to fly away from markers who might need a second look. Brandt can play across the midfield, and already has 13 caps for Die Nationalmannschaft. In FIFA, he hits a heady 88 with dribbling and pace his strongest attributes. His potential brings the same rating as the aforementioned Özil, and he won’t have to wait very long to pull alongside the former Schalke and Werder Bremen man again in the real world, with Germany playing friendlies with Spain and Brazil next month in preparation for the defence of their FIFA World Cup title. The crown jewel of American soccer, Pulisic had a direct hand in 11 goals in qualifying for the World Cup, something the USA failed to do; a fact that brings into sharper focus quite how good he already is, carrying a struggling team on his shoulders, at the tender age of 19. Watch: Christian Pulisic is already a star for Borussia Dortmund! There’s nothing small about Pulisic’s talent. Real Madrid’s Gareth Bale and Manchester United ‘s Alexis Sanchez are among the players he can match in FIFA ‘18’s Career Mode to become one of the best players on the planet. Arp had to get legal permission to play in Hamburg’s Matchday 14 opener in Freiburg, with German youth employment law stating that U18s could only work until 20:00 CET (the Friday night game kicked off at 20:30). The clamour to get Arp on the pitch is understandable. The now-18-year-old already has the makings of the complete centre-forward, and 18 goals in 19 games for Germany’s U17s last season are testament to his ability. More experienced forwards like Bobby Wood and Andre Hahn already looking over their shoulders at the attacking prodigy. 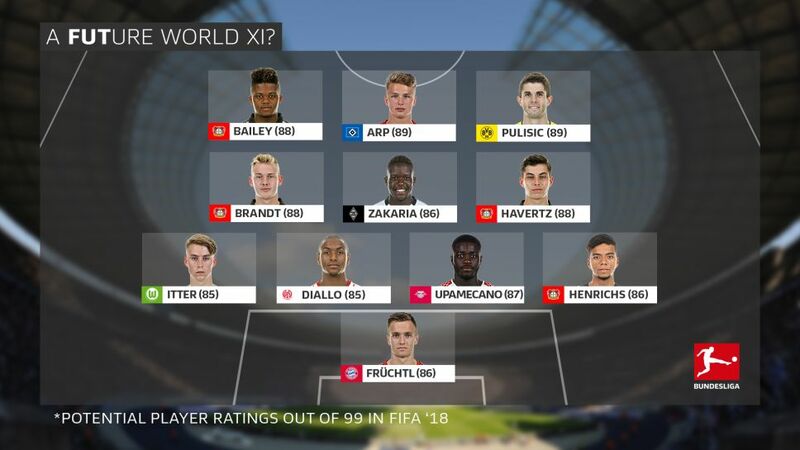 FIFA 18 has him being more promising than Leipzig’s Timo Werner – a player who looks odds on to be Germany’s first-choice striker at the World Cup in Russia – while Harry Kane, a player Arp has been compared to in style, has a rating of 86 in the game. Arp’s potential takes him beyond that to 89. Leverkusen are well represented in this list, and with good reason, but Bailey may well be the best of the Werkself bunch. Signed in January of last year, the Jamaican-born winger took a while to get going, but has hit the ground running – nay, sprinting Usain Bolt-like speeds – this term, with nine goals and five assists making him the deadliest wide man in the Bundesliga, ahead of Bayern’s Arjen Robben and Leipzig’s Emil Forsberg. Watch: Leon Bailey has made the Bundesliga his own this season! There is an international scramble at hand for Bailey’s allegiance with the player refusing to commit to his country of birth. “Which country I play for is still open,” he says. Whether England will, or indeed can, take him up on that remains to be seen. However, with a FIFA potential rating of 88, he does at least draw level with Bayern great Robben. Whisper it quietly: is he as good as the Dutch wing wizard already?